The fastest way to order is at our online store. Need some stevia? The easy stevia choice is Body Ecology Premium Stevia; high quality stevia with no aftertaste. Go to our online store stevia page for more information. WANTED TO KNOW THE MEASUREMENTS OF STEVIA AND SUGAR. How much to add to 1/2 cup of sugar to equal one cup sugar when cooking? Would like the Stevia cookbook. Thanks! I would be very interested in the cookbook. Mistake in the Conversion Chart? Should be 4 tablespoons sugar = 1/4 teaspoon powdered stevia extract??? If one cup of sugar is 8 oz. or 16 Tablespoons. or 48 teaspoons, then how much stevia for 2 oz. (or 4 Tbs. or 12 tsps.) of sugar? If one cup of sugar substitutes for one teaspoon of stevia, then 1/4 cup would substitute for 1/4 teaspoon stevia? 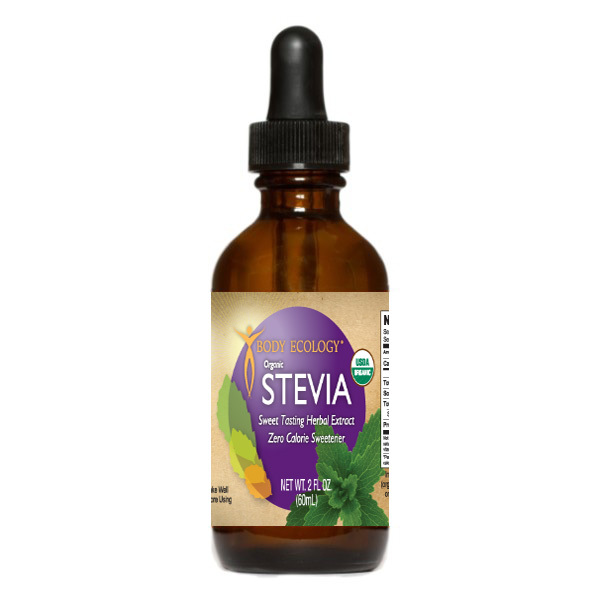 Seems like the formula for liquid stevia (1 teaspoon stevia in 4 Tbs. water) is also way, way too strong. Maybe 1/4 tsp. stevia in 4 Tbs. water? Or maybe even less? Maybe this is why some say they do not like the taste, they are using far too much stevia. This website is awesome and I really want that cookbook !!! I would also love the cookbook. I bought the stevia plant at a near by nursery in Coopersville, Michigan. I have it in my herb garden and I’m looking for recipes for my husband who is diebetic. Looking for the cookbook as well? Is the product usable in baking yeast breads? If so, which one liquid or powder? Will Stevia act as a “fuel” for yeast in baking as sugar does? No! Stevia is non-fermentable and therefore will not act as a food source for yeast. (This is why stevia is great for anyone suffering from Candida!) Breads will still rise when baked but just not as big. When and where can I get a copy of this cookbook? Would like a Stevia cookbook! Please include me on the list for the cookbook. Thanking you in advance. just wondering how to measure Stevia in a recipe that calls for sugar? ie) splenda measures the same, however Stevia is a sweeter taste, so if a recipe calls for 1/4 cup sugar, how much Stevia? Please let me know the answer to this question also. How do you make up for the loss of the sugar in a recipe?